The moon children are walking suburban streets, half-lost amongst our ordinary. You think you don't see them, but really they are nothing like ordinary, and you simply don't understand what you are noticing. The old odd hat. The eyes like gold. They try but they don't get it quite right. They are otherwordly, ancient story. They traipse that story through our lives and leave us glints of wild enchanted poetry. 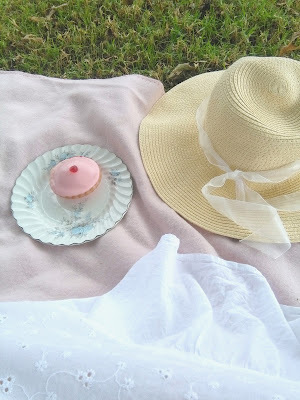 I went for a quiet little picnic today. With sandwiches and fruit in my bike basket, as well as a book to read and a book to write in, I rode to a nearby reserve. Halfway there I decided to treat myself to a cherry blossom cake, which is a favourite of mine from childhood. I couldn't really afford it, but sometimes a girl needs cake. The woman in the cake shop put down a broom to serve me, and although I am rather anxious about germs I chose to smile and say nothing, rather than frown worriedly. There was something gently beautiful in her eyes. She admired my bike and said it reminded her of when she lived in the South of France and would cycle everywhere on her velo : "You see so much more, and appreciate it more, when you are cycling." I agreed, and told her how lucky she was to have lived in the South of France. She said it had been a dream of hers, and she'd kept her heart open for twelve years until the dream came true. "When your heart is open, all kinds of doors can open," she told me. I rather wanted to buy her a cup of tea and sit to hear the wonderful stories I'm sure she could have told me. At the reserve, I walked my bike over the grass until I found a lovely place shaded by trees. 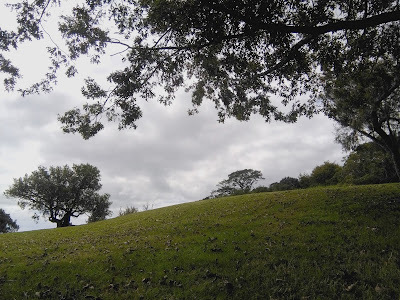 Here I was alone for as far as the eye could see, other than mynah birds and a fleet-footed pukeko. My book remained unopened; I simply sat soaking in the peace. Everyone loves summer, but autumn is very much more beautiful to me. I must admit, I was a little sad, as we all can be at times, and for some reason got to thinking about Christ, about how he was my first love, and how his voice must sound like the wind through the autumn leaves. Did you know a person can be pagan and still believe in the universal christ? Well, there you go. As I was sitting thus dreaming, an elderly couple walked by. Usually I will keep my eyes lowered, since I am shy and this is Aotearoa where we don't really engage with strangers, especially when they stroll through our perfect peace. But today I opened my heart and waved to them. They waved back cheerfully. And then they stopped, and the man lifted an etched wooden pipe from out of nowhere, and began to play to me. Old music of stone and mist, sunlight and memory, danced around me. Macedonian folk music, he said, and we got to talking delightedly, brokenly, for Macedonia is very special to me. After a while they wandered on, and his pipe music floated over the grass, through the trees, as he went. I imagined a part of myself dancing behind him into dreams. Keep you hearts open, friends, for Love is always waiting to walk into your quiet with a song of magic and old, wild beauty. this is most beautiful to read. and we all need reminders to "keep our hearts open", so thank you. "...for some reason got to thinking about Christ, about how he was my first love..."
You surprised me. :) I did not know. My first love was Captain Kirk. But then came Christ. When did you know Him? You know, He never really lets go. How did you lose it? This is the place for long stories. Unfortunate book misquoting scripture, young child didn't dare ask adults for the truth of the matter, kaboom Christian faith. I was actually raised pagan, although there was nothing anti-Christian in our household, infact quite positive towards Christianity. (This was before politics entered the whole field - back when people could keep folk traditions happily alongside whatever religion they liked.) But that faith dwindled too because I could never afford all the ingredients, lol. Came back to God after listening to the Anglican priest's speech at Princess Diana's funeral, practiced as a pagan but struggled with what it had become in today's society, reclaimed Christianity for a while after lots of studying, lost it again after going to church, now really am just a jumble of things but at least certain the Divine exists. I've always been doubtful of evolution and even a lot of physics, I believe in divine creation, the universe as a living soul, magic, miracles ... Just not in the terms the Bible puts them. I've studied Bible history too much to have trust in that book, and religious history too much to have faith in any established religion, pagan or Abrahamic. I'm closest to being Quaker, except I went to a meeting once and just about died from the agony of all that silence. "...reclaimed Christianity for a while after lots of studying, lost it again after going to church..."
This shouldn't have made me laugh, but I howled. I wish there was an icon for laughing so hard things you ate come out your nose. Uh...wait, maybe not. But I have to ask... What was your experience of reclaiming Christianity like? And what was it about church that made you lose it again? You never know who you are talking to on the Internet or how they got there...wow. I hope you don't mind my interviewing you like this. Thanks for indulging me! To be honest, reclaiming Christianity is pretty much the same as reclaiming paganism. The divine doesn't really mind what language your heart speaks. It sees through all of that to the love. Church seems to me to have forgotten this. There's very little about love and an awful lot about the law as they see it. Hmm....they will know us by our love. I believed New Zealand was a friendly place to strangers, am I wrong about that? I've heard that tourists generally find it a friendly and pleasant place, and it's certain that if you're in trouble or lost there will always be someone to help you. However, on a daily basis, people give each other psychological space, so greeting strangers as they pass by is not common, and you don't really see many suburban neighbourhood parties, although that may be different in the countryside. I wouldn't call us unfriendly, as such. There are only two degrees of separation between people here (ie, if I got to talking to a random woman she would almost certainly know someone who knew someone else that I knew - and often the separation will be even less than that. Over and again I've chatted with people who turn out to know someone I also know.) I theorise that we keep our private space because otherwise it can feel quite claustrophobic. It's certainly one reason I maintain more personal privacy on my weblog than most bloggers.